The U-boat rose silently to the ocean’s surface in the dark winter night. This would reduce the possibility of its detection by sonar from the small convoy it was trailing. For several days, as a severe, North Atlantic storm raged it did not have a chance to strike. Now, with the weather becalmed and the convoy about 150 miles from its destination in Greenland, there was one last opportunity. With daylight, the ships would receive protection from ground-based aircraft. 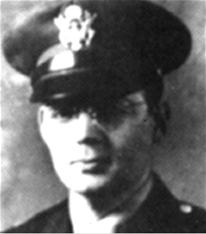 The convoy consisted of one U.S. troopship, two freighters, and three Coast Guard cutters. The largest ship was the USAT Dorchester, a reconverted, aging, former luxury liner. Its rooms had been stripped and bunk beds, three or four high, installed so that it carried 902 men – mainly servicemen, some civilian workers, and merchant seamen. Among them were four newly-commissioned chaplains on their way to their first duty assignments. The four men were of diverse faiths -- one a Methodist minister, another from the Dutch Reformed Church, a Jewish rabbi, and a Catholic priest, Fr. John P. Washington -- but with similar motivations. They all had been ordained years earlier, had experience in civilian parishes, and after the attack on Pearl Harbor were moved to minister to troops in battle. 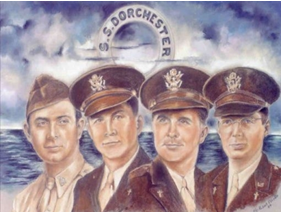 Since boarding the Dorchester in New York on January 23, 1943, the chaplains had been working as a team to counsel, comfort, motivate, and generally assist the men on board. John Washington was the eldest of seven children born to a working-class, Irish-American family in Newark, NJ, in 1908. As a youngster, he had a knack for telling stories, could laugh at himself, liked to sing and played the piano. At an early age, he felt he had a calling to the priesthood, and entered Immaculate Conception Seminary immediately after college. Ordained in 1935, he then served as a curate in several New Jersey parishes. On Sunday, December 7, 1941, he heard the news of the attack on Pearl Harbor and knew he had to enlist. After receiving permission from his pastor and bishop, he applied to the navy, but was rejected because of poor sight in his right eye, caused by a boyhood accident. His pastor said he should try the army, while a friend suggested that when taking the eye exam he should cover his right eye twice when reading the chart. The ruse worked, and Father was in the army. With an attack possible, the captain of the Dorchester ordered all men to wear heavy clothing, parkas, gloves and life jackets in case they had to abandon ship in a hurry. This would give the men a bit more time in the frigid waters, where it was estimated that a person could survive for about 20 minutes. While the outer deck was coated with ice, the lower decks were hot from the ship’s engines and the overcrowding of men. So, many did not follow the directive. About 6 P.M., Fr. Washington offered Mass for the men. Later that evening, the chaplains organized a party in the Mess Hall. Fr. Washington played the piano until about 11:30 P.M., with all four chaplains joining to sing a variety of popular tunes. Shortly before 1 A.M., the U-boat fired a fan of three torpedoes. One struck the Dorchester well below the water line on the starboard side. The lower compartments quickly filled with water, causing the ship to list and lose all power, while smoke, dust and fumes filtered through the ship. Panic set in. The air resounded with clanging bells, screaming sirens, and anguished cries. Men with a minimum of clothing rushed to the outer deck to be greeted by a cold blast of air. The dark, icy waters below promised death. Life boats were launched, but some left before many men were in them. Others were overcrowded to the point of capsizing or sinking. Still others could not be lowered because their cables were encrusted with ice. Some men were frozen with fear at the ship’s rail and would not move. Others were swept into the sea as the waves lapped over the starboard side. The chaplains moved among the men, seeking to calm their fears, encouraging them to get into the boats, and assisting wounded men to safety. They opened lockers on deck and distributed life jackets to those who did not have them. When the life jackets were all gone, they took off their own and gave them to others, in spite of the fact that this meant they would not survive. About 20 minutes after it was hit, the Dorchester went under. Some survivors later said that their last memory of the ship was that of the four chaplains braced at the rail, arms entwined, praying and singing aloud. Only 230 men were rescued; hundreds of others were dead from hypothermia. The chaplains were posthumously awarded the Distinguished Service Cross and Purple Heart. They were considered for the Medal of Honor, but the stringent requirements that it be awarded for valor under fire, precluded it. Congress, however, in 1960, authorized that a special gold medal, called the Four Chaplains Medal, which was meant to carry the same importance as the Medal of Honor, be awarded to them.